Nature's Heroes - Blog Show the Love 2018: our favourite bits! Another Show the Love week has come and gone and we're already missing the daily deliveries of fabulous crafted hearts that have been landing on our desks for the last 5 months! Next month we'll have the final figures and highlights from The Climate Coalition but for now we wanted to share some of our favourite bits from Show the Love 2018. Crafted hearts smash last years' record, and get nominated for an award! 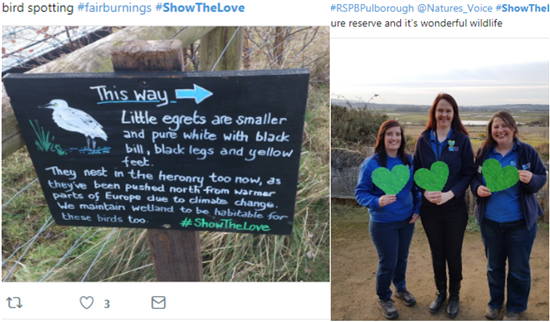 Last year around 400 hearts were created by RSPB staff and volunteers for use as part of Show the Love. This year we thought supporters might like to join in too, and you did not disappoint! This year 50 people made a total of 667 crafted hearts of all shapes, sizes and materials. A further 155 hearts were sent to The Climate Coalition to use with Front-Bench MP's, Ministers and VIPs - including one that went to the Prime Minister! Every single one of the recipients will have received a hand-made heart with a personal message on the back about why nature is important and why we need to tackle climate change. As well as being a lovely thing to give to someone, it is also very powerful as can be seen by the smiles and pride on many of the recipients faces. Top Row (from left): Mims Davies MP, Ben MacPherson MSP, Thangam Debbonaire MP. Middle Row (from left): James Robinson RSPB Regional Director for Eastern England, Katie-Jo Luxton RSPB Cymru Country Director, Robert Lingard RSPB Senior Parliamentary Officer. Bottom Row (from left): Chris Packham, Ferne Corrigan and Simon King. All images taken from Twitter. On Valentine’s Day itself, RSPB Cymru teamed up with Wales Environment Link (WEL) to invite Species Champions, Ministers and other Members of the National Assembly to celebrate the steps being taken to tackle climate change in Wales. 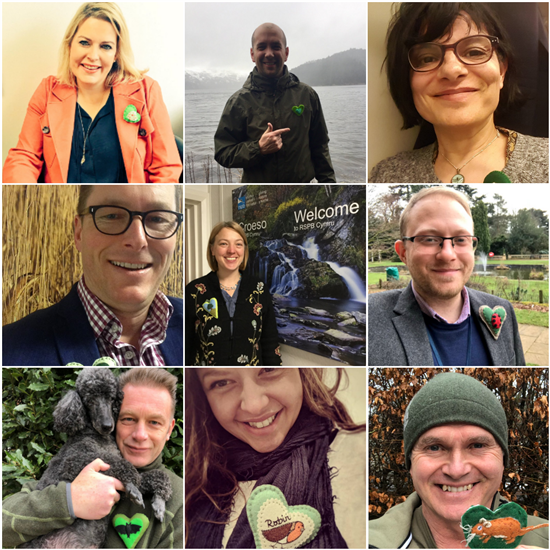 At a lunchtime event held at the Senedd building in Cardiff Bay, 25 Assembly Members (AMs) in total were delighted to be presented with hand-crafted green hearts made by talented RSPB supporters, and could be spotted wearing them in the chamber later that day. Those AMs involved in WEL’s Species Champions project were particularly impressed with their hearts which depicted the species they champion, and many took the opportunity to declare their support for their species, the project, and the Show the Love campaign when speaking in the Welsh Assembly that afternoon. Exciting news reached us last week as supporter Claire Tinsley's fabulous hare crafted heart, which was given to Liz Bonnin, has been shortlisted for the Best Green Heart Award at next months' Green Heart Hero Awards! Huge congratulations to Claire and finger's crossed for a win. We'll bring you more news from the Awards next month. Claire Tinsley's amazing heart that has been short-listed for a Green Heart Hero Award. Good luck Claire! 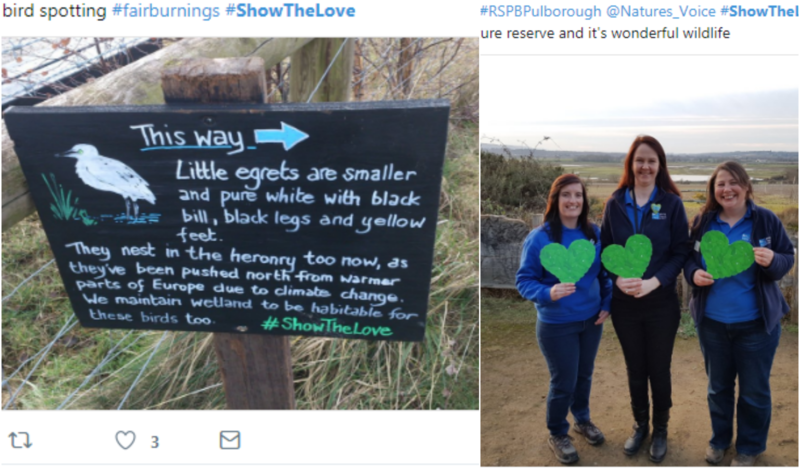 At least 32 RSPB reserves across England, Scotland and Wales got involved with Show the Love 2018, from having stickers to give to visitors to running specific activities like crafted heart-making and self-guided walks that highlighted reserves' climate stories and how the RSPB is managing habitats specifically to help wildlife thrive and adapt in our changing world. That's all very well, I hear you cry, but how effective has it been? Well, initial figures from The Climate Coalition indicate that the campaign had a potential reach (the number of people who had a chance of seeing something about the campaign e.g. in a newspaper or on Facebook) of 1.2 billion! Yes you did read that right. The majority of that figure comes from the sports report they produced, and from the Rankin snowman animation, which also received over 1 million views. At least 100,000 people had stickers, or liked and shared posts on social media and around 800 events or activities have taken place across the UK engaging at least 8,000 people. As for me, my highlight was all the crafted hearts and how we were able to use them. Particularly the increased engagement with politicians. This might be an awareness raising moment when we reach out to new and wider audiences, but making sure decision-makers feel the warmth from Show the Love is important too. To engage people with something so positive and tangible (on an issue that can seem all doom and gloom, abstract and distant) is hugely rewarding and I hope those of you who took part feel the same way. Thank you all again for what is always one of the most engaging and magical times of my campaigning year! Why not check out The Climate Coalition's highlights too.